The Abu Helw community is located northeast of Ma’ale Adumim, southeast of the Nofey Prat settlement, and southwest of the Kfar Adumim settlement, along both sides of Road No. 1 that leads to Jericho. South of the road is a cluster known as Um Ad-Deif, home to the Abu Dahuq and Abu Falah families, and north of the road is the Al-Helw cluster, home to the Abu Dahuk, Kurshan and Tabaneh families. 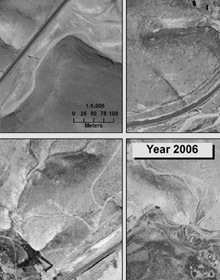 Settlement of the area occurred prior to the paving of the current course of the road, whose construction split the clusters that prior to this had open access to one another. The community arrived from Tel Arad after being deported in the beginning of the 1950s, and it settled with the agreement of the private land owners from A’nata. Today, most of the lands in the locality have been expropriated, as part of the large land expropriation of 1975 for the establishment of Ma’ale Adumim. A small portion of the lands are registered state lands. Most of the territory, mainly the southern cluster and part of the northern cluster, is within the jurisdictional and planning limits of Ma’ale Adumim. According to planning maps, two roads are planned to pass through large parts of the northern cluster: Road No. 1 to Jericho and the planned road in the direction of Anatot Junction, such that the entire cluster is surrounded by roads – existing or planned – on almost every side. Initially, the site was selected for settlement due to the local conditions including the open spaces for grazing. Over time, the space was gradually reduced due to land expropriation, the establishment of settlements, and the closure of areas for military use and for the installment of military bases. As a result, in an attempt to find open grazing areas elsewhere, at the beginning of the 1990s some thirty families moved, together with their flocks, to the Bethlehem, Ramallah and Al-E’izariya areas. The flocks of those who remained were reduced significantly and their grazing options are now very limited, such that the animals are kept almost all year in pens. In addition, the character of construction in this locality is special in that the homes are relatively close together. According to residents’ claims, this is necessary due to the pressures placed upon them over the years and from limitations in movement and land use. With the expansion of the main road, residents were forced to demolish and relocate many of the homes, including the communal tent (“diwan”), to a location further from the road. In the mid-1990s, a number of demolition orders were issued for buildings in the locality, and in 1997, seven homes were actually demolished. The demolition orders were reissued in 2009 and 2011, and today all of the buildings are under valid demolition order, and any changes or additions instituted to existing structures are demolished almost immediately. There is an elementary school there that serves local children and children of neighboring clusters in Al-Khan Al-Ahmar, serving a total of approximately 85 pupils from all five clusters. The school building, constructed of tires and earth, was built collaboratively with residents from all of the communities, and with the assistance of the Italian non-governmental organization “Vento di Terra.” In the middle of the cluster is a plot of land, approximately 700-800 square meters, which constitutes a kind of open public area between the homes, and serves the entire community during special events such as weddings, funerals, and various celebrations. In addition, there is a .05 hectare plot in the northern margins of the cluster where residents jointly cultivate vegetables for home use. The unemployment rate has been extremely high, hovering around 90%, ever since residents were forced to reduce their flocks, which today provide mainly for the manufacture of milk products for home consumption, and because employment in construction and in factories in the settlements is neither regular nor stable. Very few individuals work outside of the community; some occasionally bring in income from local tourism. The women do not work at all outside of the home; they do not take part in supporting the household, though some were trained as teachers, and despite their knowledge of crafts and attempts that were made, together with UNRWA, to turn this knowledge into a source of income for them. In the past, residents had access to a number of springs and water sources in the immediate area, including the springs of Wadi Qilt. Today, these are all blocked to access, due to restrictions imposed by the nature reserve or closed military zone orders. Instead, residents purchase water from “Mekorot,” which also supplies water to all of the other localities near Al-Khan Al-Ahmar. 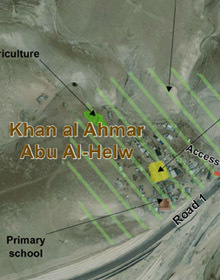 In 1990, a connection to the water infrastructure was formally arranged, which also supplies water to all of the localities near Al-Khan Al-Ahmar. The water supply is not always regular, and is often cut off. The residents therefore use in addition water tanks purchased by the residents and placed near their homes. Although the clusters are close to the main road, there is a formidable problem of accessibility, and in order to reach the place, residents much take a large detour along dirt roads that are in a constant state of disrepair. The public transportation that passes along the road is prohibited from stopping along the section near the clusters of Bedouin settlement, and the authorities take great care to block the connecting entrances from the main road to the dirt roads that lead to the clusters. Moreover, expansion of the road greatly increased the noise pollution and the dangers of being run over associated with living so close to it. 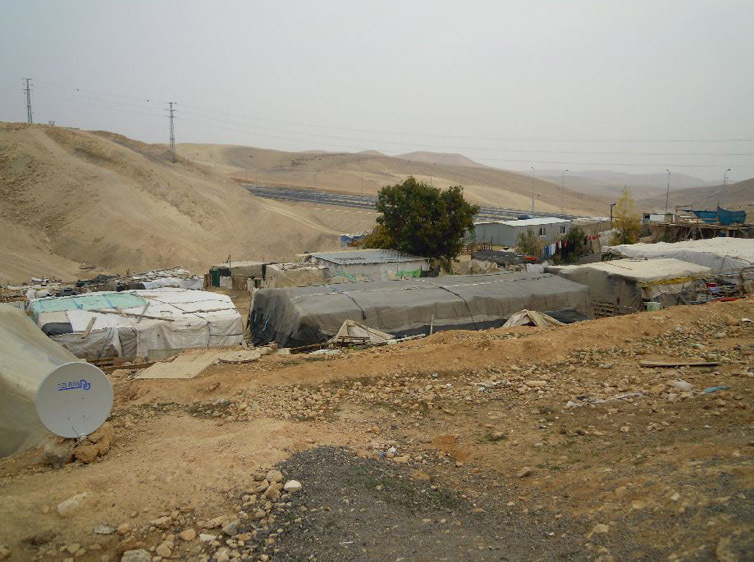 An additional environmental hazard that interferes with the lives of the residents is the sewage flowing in their direction from the settlement of Kfar Adumim, which leads, mainly in summer, to grave problems of stench and mosquitoes.